The reward of watching movies multiple times is being able to approach the material from different angles. 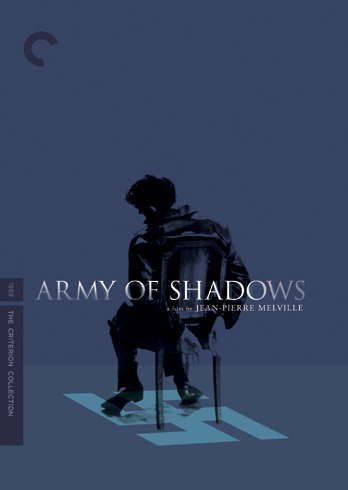 This is my third format for seeing Jean-Pierre Melville's Army of Shadows--I first saw it in its theatrical re-release, then on DVD (my original thoughts are here), and now Blu-Ray--and this time, when I was watching, I paid attention to what a spooky movie Army of Shadows can be. That title, referring to the men who led the French Resistance in WWII, evokes the image of a spectral force, and the world Melville creates for them to go through is akin to a haunted realm, the place of the undead. It's moody and gray, quiet. We visit prison camps, occupied hotels, seaside hideaways, and in each place, normal life doesn't appear to be carrying on as always. The streets lack vibrancy, glimpses of the way things were are fleeting and far away. And in this wartime limbo, the freedom fighters operate as a separate society, a hidden military. They work in secret, though their actions eventually go public. They seem to move in between the moments in which the rest go about their business--the rest being either their enemy or the citizens they hope to liberate. They are shades. They are other. Their multiple voiceovers speak in past tense, voices from beyond the grave. Made in 1969, Army of Shadows is the story of the heroic struggle against the Nazis, who occupied France through most of the war. 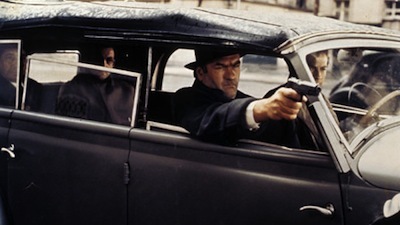 Lino Ventura (Touchez pas au grisbi [review]) plays Philippe Gerbier, one of the main players in this underground revolution. At the start of the movie, he's being taken to a camp for political undesirables. He is driven through rain, out to a remote locale, far from the world. One could argue this is the point where he is separated from reality as it had been known. He is sent to the limbo that precedes limbo, the waiting room for the halfway point. He plots an escape, but before he can make his break, his number is called and he's taken back to the city. Once he is among the SS, he slips always is if he were never really there. The spook has returned to his haunted country. What follows is a series of "incidents" and "missions." Philippe gathers his troops. Amusingly, it's almost like a manicured Hollywood war team--a brute, a young man, an old man, a handsome guy, a woman who really has it together. They engage in a somber combat, their actions almost imperceptible. There is the gut-clenching pain of having to kill a traitor by hand, and the delivery of supplies through tightly guarded checkpoints, and even a trip to England to try to garner support. There the otherness is even reinforced: during an air raid, Philippe stumbles into a nightclub where British soldiers are dancing. The revelers don't even notice he is there. They barely notice the bombing. They have found an oasis from the war. This is another world: Philippe and his "Chief" (Paul Meurisse) go to see Gone with the Wind . To the boss, a signal that the war is over will be when his countrymen can also experience this cinema--itself another story of struggle and division (though about as far afield of Army of Shadows in terms of tone and style as you're likely to find). Melville plays with distance throughout Army of Shadows. Not only is the commonplace now far away, but these people who are working together are also separate, working under fake names, avoiding sharing details of their past lives. He creates formal compositions to mirror the exactitude of their planning. He foregrounds and backgrounds characters on the screen to indicate their current mood. 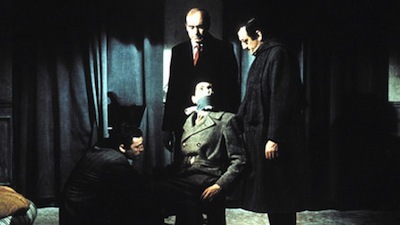 For instance, when Jean-Francois (Jean-Pierre Cassel) decides to distance himself further, Melville puts him in the extreme foreground, away from the rest. The camera eye probes scenes, such as in the prison when Philippe passes around his cigarettes, and director of photography Pierre Lhomme circles with the packet, watching its journey. Melville also concocts an ironic ruse, showing Philippe working out of a talent agency, using theatrics as a front. All of these resistance fighters are performers themselves, they all have distinct roles to play. Army of Shadows is essentially an espionage picture. It's not a war movie, even though it does involve the war. Rather, this is about the often unsung heroes, the ones who never got their due, who slowly pushed the rock up the mountain to try to make a difference. It's about tough choices and careful maneuvers. The narrative is multi-layered, complex to the point of abstraction. It's not an A to B to C plot in that each sequence suggests the next. Instead, Melville, who wrote the script from a novel by Joseph Kessel, focuses on the unexpected, the developments no one planned for. Fittingly, then, it's the everyday things that cause the most trouble. For instance, Mathilde (played by the great Simone Signoret) runs afoul of the Nazis because of a photo of her daughter she refuses to discard. Philippe also gets arrested because he's found having a meal in a restaurant that serves black market meat. It's almost like he forgot that this kind of place, sitting with others and having a meal, isn't for him anymore. It leads to Army of Shadow's most existential moment, where Philippe goes against his own self-belief and must question why everyone else knew what he would do better than he did. The Nazi guards at the prison cruelly line up their prisoners and tell them to run. If they can outrun the bullets, they will live to race death again. Philippe tells himself he will not go, but something else takes over. Fear? A survival instinct? Or maybe fate...? Francois also makes an existential choice in the movie, but he does it in secret. He doesn't even tell his comrades. He lets himself get captured, and they think he's run off. It's a perfect example of the kind of heroism I've been trying to describe. Doing what you think is right for you, and for no other reward but being true to yourself. It's an act born of alienation, but turning that lonely dread to positive action, the kind of ideal existential expression that is often glossed over by those who misunderstand the philosophy. In Philippe's moment of crisis, Melville cuts away from him and shows the actual shadows passing on the wall, the flickering figures of the titular army. One could bring up Plato's Cave, or even return to the theatricality and the whole concept of "shadowplay." Instead, I think this brief image is as straightforward in its symbolism as it seems: our experience is fleeting and difficult, but if we stand away and look at the outline of who we are, we can truly see ourselves. The true army of shadows is the congress of man, inconsequential and disconnected, but marching forward nonetheless. Criterion's 2007 DVD of Army of Shadows was one of their strongest entries in the SD format, earning high marks from me back when it was released. I'm pleased that the new HD transfer of the 2004 restoration actually improves somewhat on the original release. The changes are subtle, but they manifest in the clarity of detail and the rendering of the colors. This is a very soft movie, taking place in perpetually cloudy weather. The dour grays and blues and the hazy pallor that hangs over everything is chillier here. I wouldn't call it more pronounced, that seems counter-intuitive, but it does have a stronger overall emotional atmosphere. You can really notice it in the scenes of nature. The opening shots of the rainstorm are striking for how much rain we see, whereas the nighttime escape on the beach later on reveals all sorts of color gradients in the water and the sky. There is more nuance to both surfaces, and our eyes can now track the changes. Later, walks in the park give us nice greens. The actors also benefit, with skin tones and the lines on their face bringing their expressions to the fore, an important thing in a movie where so much occurs in silence. The original mono soundtrack is presented here in an uncompressed format, while there is also a second choice of stereo mix in DTS. I moved back and forth between them and didn't notice too much difference, though at times the stereo actually did sound more open, like there was a defined space between the two channels.